Savannah, Georgia, has an incredible history. As the oldest city in Georgia, the stories it tells are always outstanding. While you’re here, you might want to tour some of the many historic sites our city is known for, such as plantation tours in Savannah, GA. However, the plantations here may not be what you are expecting. To discover even more things to do in Savannah, take a look at our complimentary Vacation Guide! What Happened to the Plantations? When you come to Savannah, you’ll find that the typical Southern plantations are nowhere to be found. The history here is a little different than what you’d expect. Not many plantation owners actually lived at their plantations, and if they did, the houses were not as grand as you’d expect. Many of the plantations that remained after the Civil War are no longer standing or have been turned into something new, such as the Lebanon Plantation. Now, this plantation serves as a farm for a local company and is not open to the public. However, there are still some great places to visit. Here are a few of our favorites. The Wormsloe Historic Site, also known as the Wormsloe Plantation, is one of the only actual plantations you are able to visit in Savannah. This 882-acre property is home to a rich history that you can spend hours exploring. Enter through the pathway shaded by ancient trees draped in Spanish moss to start your experience. It costs just $10 to enter, and you could easily spend the entire day walking the trails here. Stop by the tabby ruins, the oldest standing structure in the state of Georgia, before heading to the onsite museum. It’s a great and beautiful place to learn about Savannah’s past! Although the Rose Hill Plantation House is not in Savannah, its close proximity makes it a great plantation tour to take during your stay at Presidents’ Quarters Inn. Built in the 1850s, this stunning home has been completed renovated to bring it back to its former glory. Schedule a tour to see gorgeous architecture and learn all about the people that once resided here. The Owens-Thomas House is not technically a plantation, but this historic home is a must see during your vacation. A short walk away from Presidents’ Quarters Inn, this National Historic Landmark is known for its beauty and elegance. The property takes up an entire block of the city, and tours are available every day of the week. You’ll get to learn all about the people that lived and worked there 200 years ago as you go through the rooms filled with period pieces and beautiful art. Are you ready to take some plantation tours in Savannah, GA? 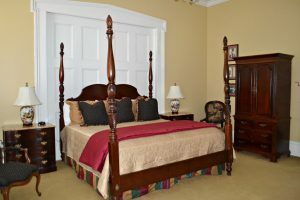 Learn about the past of the oldest city in Georgia when you stay at Presidents’ Quarters Inn. Our inn was constructed in 1855, so it even has its own story to tell. Browse our luxurious accommodations to start planning your stay; each has the perfect balance of antique furnishings and modern amenities. We look forward to hosting you!